Your Hotel in Füssen near the Castles Neuschwanstein and Hohenschwangau! You are "Longing for the Bavarian paradise" and you are looking for a Hotel near Neuschwanstein? Your 4-Star-Superior holiday and spa hotel in the middle of the city of Fussen is next to the famous castles Neuschwanstein and Hohenschwangau. Birgit and Norbert Schoell are looking forward to welcome you at that unique hotel with its combination of tradition, innovation and modern living in Bavaria! Enjoy the perfect mix of romantic and modern luxury in every hotel room! Traditional culinary enjoyment at Hotel Schlosskrone’s Bavarian Restaurant „Himmelsstube“ as well as in the Italian Ristorante „Chili“ or at the award-winning traditional pastery shop Kurcafe with its Cafe to sit and enjoy the wonderful cakes. Relax at Schlosskrone’s royal Spa near Neuschwanstein and in the middle of Fussen’s historic town. The beauty of the nature from the Bavarian Alps with its mountains and lakes, combined with cultural highlights as the castles of King Ludwig II. and the harmonic atmosphere of Fussen’s only 4* Star-Superior holiday- and spa hotel with its unique „Schloss Spa" guarantee your perfect holiday feeling! Castle Neuschwanstein is just a jump away from the friendly family hotel “Schlosskrone” in the heart of Fussen’s historic district. 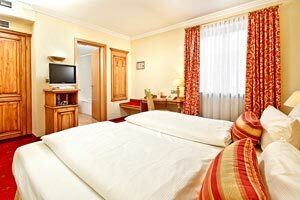 Also for Sportsmen is Fussen and hotel “Schlosskrone” near Neuschwanstein the right place to stay at. Enjoy the view at castle Neuschwanstein when you are taking a bath at the „Alpsee“, rent a boat, bike around lakes or hike the wonderful mountains. Fussen is the right place to stay no matter if you are planning an active or spa holiday, or hiking or bike holiday or only a short break, hotel “Schlosskrone” in Fuessen is the right place for you. The untouched nature with seven clear blue lakes and your Hotel Schlosskrone team is waiting for you. In wintertime the white mountains are the best place for winter Sport enthusiastics. Enjoy the time when you are cross-country skiing, alpine skiing, sledding or when you are at one of the many cottages in the area, before you come back to your hotel “Schlosskrone” and spend a thoroughly restful night in the comfortable hotel room.